The Burton Name Dropper is the weapon of choice for midwest rail savant and Burton Pro Ethan Deiss, and if you've ever watched Ethan ride you'll understand that this board is built tough. The Name Dropper's true twin shape allows for a versatile ride regular or switch, while its Off-Axis Filet-O-Flex creates an ultra-thin core profile that makes this board a playful contender on the park scene. New this year to the Name Dropper, is Burton's Purepop Camber profile that adds regular camber in between the feet, a flat zone just outside your bindings, and a slight reverse camber zone on the contact points which allows the board to maintain great pop and snap on take-offs while still remaining playful in the nose and tail. Finish this deck off with a high end sintered base, for a fast and strong ride. and you've got everything you need, sending it in the streets and the parks just like Ethan Deiss... It's a lofty goal but you can try! Weight Range 100-150 lbs. 120-180 lbs. 120-180 lbs. 150-200 lbs. 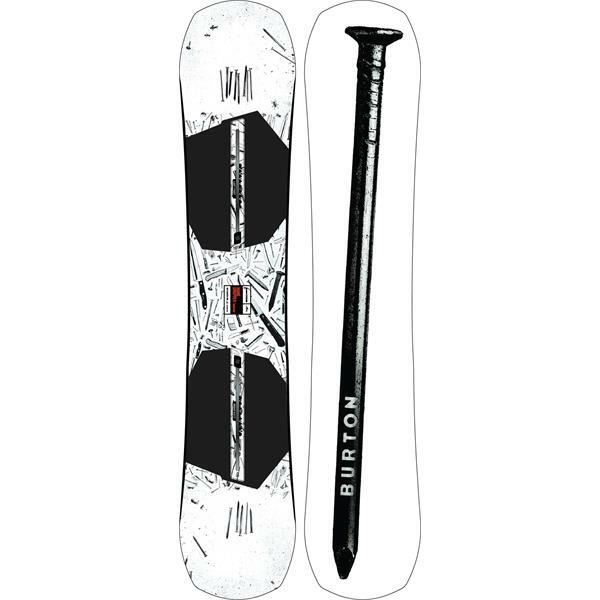 Burton channel system snowboards will only be compatible with Burton's EST bindings, Burton channel compatible bindings, or other bindings specifically listed as Channel Compatible. The Best Board I've ever used. Tons of Pop!!! Very light and playful. Super responsive with great edge control. Awesome park board that I've enjoyed all over the mountain on groomers and back woods.